Valentine’s Day is just around the corner, and for some of us, it’s another opportunity for planning out the best dates. Everything has to be perfect, from finding the prettiest bouquets to dining at the most elegant restaurants. Haven’t had the time to get all these things down yet? You probably won’t have much luck making dinner reservations this late in the game, but it’s not too late to make up for it. Get jewellery, instead. Gifting jewellery is probably one of the most passionate — and quite frankly, the easiest way to show off your penchant for romance. You won’t go wrong with heart-shaped lockets and showers of diamonds for the season of love. But if you’re considering something a little different, scroll down for other sparkly treats to get for your loved one. P.S. To all the single ladies, here’s how to shower some love for yourself too. The Juste un Clou bracelet is a classic piece that should be made a staple in every lady’s jewellery collection. Late last year, Cartier revealed a thinner model of the original design available in both yellow and pink gold. Called the SM (or small model, for short), there are no hinges or catches on this design, effectively making it a bangle. It’s a more casual accessory, great for everyday wear. For the eco-conscious, sustainable jewellery is the way to go. Swarovski’s fine jewellery brand, Atelier Swarovski, specialises in lab-created diamonds and sustainably-sourced gemstones. This piece, designed by British designer Stephen Webster, features square baguette-cut lab diamonds amounting to a total of 2.88 carats set in recycled gold. There’s also rose quartz in each little gold cage, just to make things a little more romantic. There’s nothing quite as elegant and as seductive as a pear-cut diamond. Here, French jeweller Fred interprets this simply as a pendant resting on a tear-drop halo of diamonds. The thoughtful addition of a hidden bail at the back of the frame gives the impression of the pendant ‘floating’ on the necklace chain. Tip: Get a pair of matching earrings and make it a set. Here’s one way to reinterpret a bouquet: Chanel adopts its iconic floral motif for its latest high jewellery collection, the Camelia. 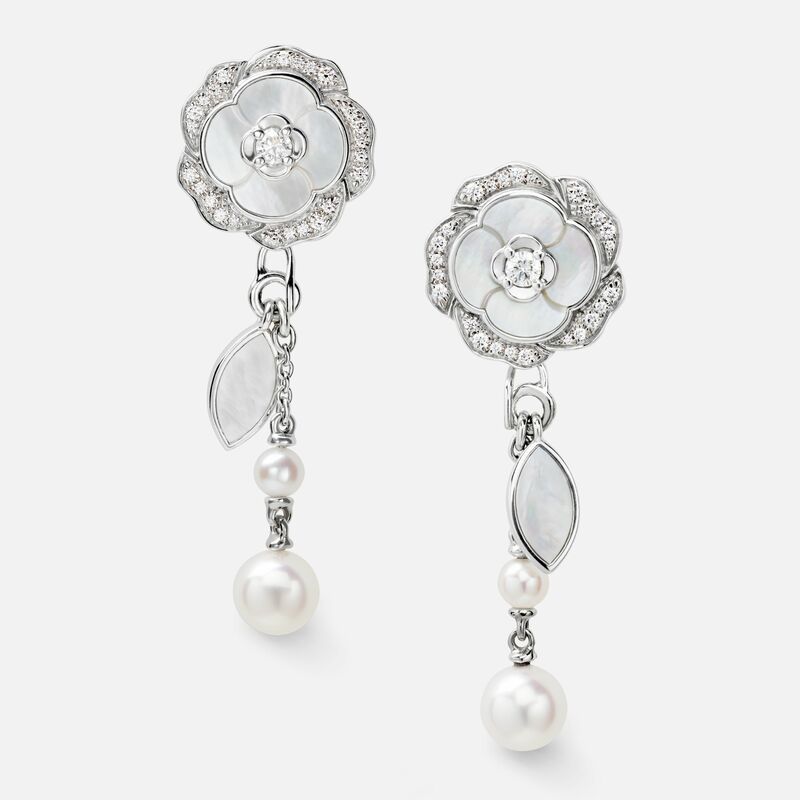 In this pair of white gold earrings, the ‘petals’ are made up of a bevvy of diamonds and carefully inlaid mother-of-pearl panels, accompanied with ‘tendrils’ of leaves and pearl drops. Like most pieces in the Camelia collection, these earrings are convertible: they can be worn as drop earrings or simply as studs. Chinese model Angelababy made iconic Chaumet’s Josephine ring, an opulent tiara-inspired piece featuring a massive six-carat diamond flanked by half-a-dozen smaller pear-cut gems. It may prove to be a bit of an overkill for Valentine’s Day, but you might find the more contemporary Aigrette more agreeable for the princess in your life. The Aigrette is simplified as a contoured band of diamonds topped with a pear-shaped gemstone.